I have been using Colloidal Silver for years and making it for 3 years using a high voltage method using baking soda and distilled water, and a low voltage method making a another form of silver using one machine being bought off ebay and one from cs supply out of Texas. Do to bad luck I developed MRSA about two years from a hospital visit on my skin. My silver could not do anything with the infection until I added pure Allicin Max to the silver. Well it worked better (but no cigar)!!! Then I read a article about stabilized Allicin added to ionic silver that showed great results (Iran study) and noticed active sores healing much faster in only two days. I will keep you informed on the out come !!! I cannot afford the expensive brand because of having to used so much silver for cleaning the house and constant internal use. MRSA is now killing more people than aids world wide !!! I have been on many antibiotics causing the infection only to get worse. 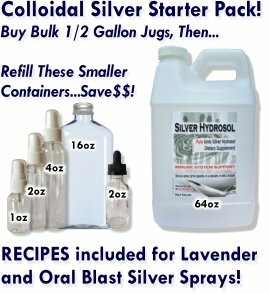 Thanks again for m CSHstore.com for making a great Ionic Colloidal Silver at a great price!!! !